Ford has announced the most powerful diesel Kuga ever – which also happens to emit significantly less CO2 than the diesel Kuga it replaces. Superseding the Kuga’s 2.0 TDCi engine, a unit that has accounted for 95 per cent of Kuga sales in the UK in 2014 so far, the new 2.0-litre Euro 6 compliant diesel delivers 180PS and 400Nm, a 10 per cent power hike. Despite that, it emits 19g/km less CO2. Upping the power of Ford’s most popular diesel Kuga has allowed the company to slot in a less powerful version of the 2.0-litre TDCi beneath, which generates 150PS and emits just 122g/km CO2, returning a claimed 60.1mpg. The revised Kuga range is completed by a new 1.5-litre EcoBoost petrol, which emits 143g/km – an improvement of 11g/km over the 1.6-litre EcoBoost it usurps. These efficiency improvements are the result, in part, of Ford’s decision to include Auto-Start-Stop and an Active Grille Shutter as standard across the entire Kuga range. As before, Kuga buyers get a choice of front-wheel drive and all-wheel drive powertrains, with manual and dual-clutch Powershift automatic options. The new Kuga range, which now boasts new colours Ruby Red Metallic, Magnetic Metallic and, for the first time on any Ford vehicle, Tiger Eye Metallic, starts from a fiver under £21,000. That’ll buy a 1.5-litre EcoBoost in Zetec Trim, while a top-of-the-range Titanium X Sport 2.0 TDCi 180PS costs £32,045. 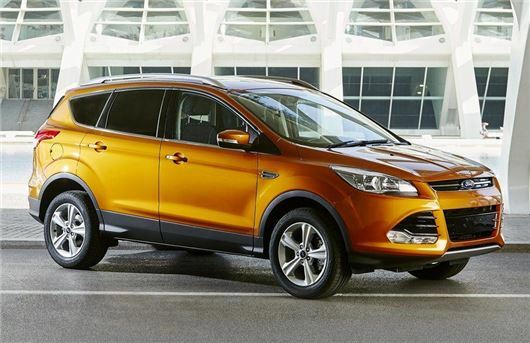 The new Kuga range is on sale now.